Build a famous scene from &quot;Star Wars Episode VI: Return of the Jedi&quot; with this stackable set! Jedi Master Luke Skywalker is trapped in the Rancor Pit beneath Jabba the Hutt's Palace and must escape. Look for a way out before the gate lifts and the mighty rancor makes an entrance! Battle the rancor with the bone before he eats the Gammorrean guard. Then, find the hidden compartment with a secret key or drop the gate on the space beast before it's too late! Combine with LEGO Star Wars Jabba's Palace (9516; sold separately) for a stackable scene with a trapdoor into the Rancor Pit! This was given to my 5 year old son from "Santa Claus". He loves these sets and builds them virtually on his own. A few months back he built the Millennium Falcon, all 1254 pieces all by himself! Nowadays I'm there for the occasional "dad can you make sure these pieces are tight". When we heard this was coming in 2013 we were so excited and he was constantly talking about it. (I was glad it came out before Christmas!) THE MOST AWESOME PART OF THIS SET IS THAT THEY PLANNED FOR IT WELL IN ADVANCE BECAUSE IT IS AN ADD ON TO JABBA'S PALACE. THEY LITERALLY GO TOGETHER ONE ON TOP OF THE OTHER SO THAT THE TRAPDOOR DROPS THE FIGURES INTO THE RANCOR PITT. Detail as always is great he has been playing with it for 2 straight days! (There are still 7 other Lego sets he got for Christmas sitting under the tree waiting to be opened...... I admit that some sets seem higher priced than they should be based on size and piece count when compared to other sets, but not this one. It was half the price of Jabba's Palace, about half the pieces as well. We are huge fans of both Star Wars and Lego! Keep the sets coming! My son is already talking about some of the new sets and can't wait till we visit the Lego store this weekend to spend holiday money! Lego + Starwars what could be better!!! I ordered on line and this was the best price, free shipping and delivered before the date, what could be better!! Thank you Walmart.com. I purchased as a gift for our grandson. This combines his two great loves! One thing regarding Lego, make it easy for the kids to keep all the pieces together. They need a box, Tupperware or something to keep it all in. Laying a sheet on the floor and allowing the kid to play on it makes a quick and easy clean up and reduces the oppps up the vacuum!!! Son has wanted and loves the set! Been keeping an eye out for this set for a while. My son has been wanting this set for a while, especially since he saw the rancor in a static display. Out of all the figures, that was the one he HAD to have. Walmart had it on sale and we picked him up a set. He's been loving the set since he got it put together, especially rancor! The hidden compartments, sliding drop gate, and figures are some of his favorite features of the set. He's been enjoying the set a lot! My son hasn't stopped playing with this lego set. He loves how Raincor can "eat" other lego characters. He also likes how the gate goes up and down and how it connects to Jabba's Palace. 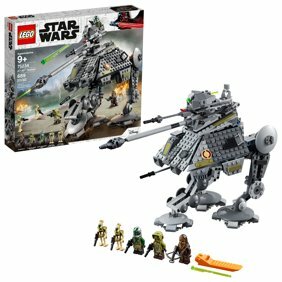 This has to be his favorite Star Wars lego set and it is reasonably priced compared to other sets! For the $60 price point this is a great set. Of course it is highlighted by the Rancor monster. I have been highly anticipating a Rancor pit and was going to design my own until I had read the announcement that this one would be made. This one delivers. When you couple it with the Jabba's Palace set you can use the trap door from Jabba's throne room to drop Luke and others into the pit. I would have liked to see the button near the door trigger the cage door to drop, but instead the door is held up by some Technic pieces that are used to manually open the gate. Although I really like the detail of the Rancor, I would have liked to see more points of articulation on him similar to the dinosaurs from the Dino product line. His tail and feet are fixed into position. For those of you that have the T-Rex from the Dino product line, the Rancor is about 1-1.5" shorter than the T-Rex. Pros 1) Rancor monster 2) Connects with the Jabba's Palace set 3) Opens up with hinged pieces 4) New Malakili figure Cons 1) Rancor's legs are not articulated 2) Luke has no lightsaber Overall this is a 5 star must-own set. Now I'll admit that I don't often buy Lego Star Wars sets, and often when I do, it's because there's a minifigure in it I really like. This was one such set, and I simply bought it for the mighty Rancor. When I assembled it though, there was a whole bunch of other cool features in this set. First, the minifigures: You get five, if you count the skeleton. The minifigures are Luke Skywalker, a Garmorrean Guard, the Rancor keeper Malakili and, of course, the Rancor. I'll start with the Rancor. What a great minifigure (if you can call it that!) it is! The Rancor is made up of 19 parts, eight tan colour claws, four articulated fingers, two arms (one with a sort of chain link cuff), chain piece, body piece and jaw piece. The hands can easily hold onto an unfortunate minifigure, and the mouth can just about fit one minifigure into it. They could have articulated the legs, but that's a minor quibble. By far the standout minifigure of the set. I apologise in advance if I don't know a lot about the characters! But anyway, Luke Skywalker and the Rancor keeper have double-printed heads so you can change their expressions. Luke has 'Relaxed' or 'Determined/Scared? ', the Rancor keeper has an odd expression and 'Sad'. The Gamorrean Guard is cool but the head and chest is all one piece (you can't turn his head), and he's the only figure that's not exclusive to the set (he also appears in Jabba's Palace). A good point is that most of the figures are set exclusive. Now the pit itself. It's been designed to link onto the Jabba's Palace set (which I don't actually own), which is a nice but rather pricey feature. The trapdoor from the Jabba's Palace set will lead into the Rancor Pit. Don't let the tiny piece count fool you into thinking you're going to get something tiny. I thought this, but you'll actually be quite surprised that it's fairly chunky and large. Still, a few more pieces could have been chucked in to make the set better value! Still, the pit is packed with features. The gate is very cool. There's a function that lets you hold it open, or lets you slam it down. There's a hidden cubby hole with some bones and a key inside, and it's location is marked by a skull. The skull helps you remove the lid of the hole to access the key to get out! The gate wall is also on a hinge which is held in place by a clip. You pull the gate wall gently and it will pop out of a clip. I'm not quite sure what purpose this serves, perhaps it's to open up the pit to let the Rancor move about? Another good thing is that there's absolutely NO STICKERS in this set (but I think you can see that in the picture). Oh yes, and while the Pit is easy to assemble, you should pay close attention to the instructions, it's too easy to misplace a brick when building the pillars! Cons: There isn't enough pieces, and while the Pit is fairly large, it should be far bigger for the hefty price tag attached to the set. Overall, the good just about outweighs the bad on this set, and the Rancor is probably the single strongest selling point. On that reason I recommend this set for anyone's Star Wars, or even just general minifigure collection. Modular designs are now commonly found in most LEGO themes. From the soaring multi-storey pet shops and period fire stations of City to the set-sprawling schools of witchcraft and wizardry of Harry Potter, LEGO models are now more compatible than ever before, making purchases such as the overpriced but irresistible Rancor Pit set mandatory for Force-sensitive builders everywhere. The set's greatest attraction is without doubt its titular Rancor creature, who outdoes even impressive offerings like the Wampa when it comes to detail and playability. The ten-centimetre tall monstrosity has jaws that open and shut, allowing its minifigure-prey to hang limp out of its mouth, and its individually-removable claws can be broken off when it's lost in the reckless zeal of bloodlust. With a broken shackle hanging from one hand and an ill-fated Gamorrean guard clasped in the other, all this megafigure is missing is the stop-motion slaver that burned Return of the Jedi's subterranean set piece into the minds of two generations' moviegoers. The rest of the set's minifigures really are mini in comparison, but it's still quite apparent that the Rancor is significantly smaller than it would have been had it been accurately produced to scale. However, as the proud owner of a trilogy-spanning Death Star that has fewer rooms than my house and an open-plan Millennium Falcon that only has room for one in its cockpit, it would be a little churlish of me to grumble too much about issues of sizing – particularly when both the Gamorrean (who's an exact replica of his colleague thrown in with the Jabba's Palace set, albeit brandishing a drumstick here instead of an axe) and Malakili are such charming little fellows. I'm especially fond of the latter, as LEGO have captured absolutely the character's defining hang-dog expression, if not his wobbling rolls of fat. In contrast, the blonde and conservative Luke Skywalker doesn't really measure up. The bone that he clutches in place of his lost lightsaber is certainly movie-accurate, but it would have been nice to have both, and his reversible head is a complete calamity as his hairpiece doesn't cover his well-defined dimples – whichever mood you choose to fix him with, the poor lad's got a chin on the back of his head. The pit itself matches the style of Jabba's palace, and is fleshed out nicely with some deft flashes of finesse such as oversized keys and even festering skeletons. It's far flimsier though, with only its gate-holding wall complete and its base and roof absent. For those that own it, the latter can be provided by the main body of the Hutt gangster's palatial gaffe, which rests nicely upon the four small pyramids that crown the pit, but it's worth noting that the palace's tower annex, which can be (and invariably is, in mine's case) connected to the throne room via a handful of interlocking pieces, cannot be attached so readily, despite what the picture on the back of the box implies. Unless you've a load of spare sand, grey and brown-coloured bricks, the best that you can hope for is to nestle the tower in next to the rest of the structure, and hope for the best. Ultimately though, any gripes that I had about this set instantly evaporated the very first time that I sent young Skywalker plummeting through Jabba's trapdoor into the pit waiting below, and I dare say that if you're interested enough in this set to have read this review, you won't begrudge a penny of its RRP. If this set wasn't conceptualized from the beginning to sit beneath the other set of Jabba's Palace I doubt I'd want it that much. I appreciate that it works with the other set, but I do wish there was a column to sit beneath the tower of the Jabba's Palace set. But enough abotu how the two sets work together. I bought this item online, which saved me about $9 and the site-to-store shipping was ready the next day! The Rancor figure is awesome and the playset is neat and functional as-is. I liked how the Rancor had to be built somewhat. This marked my first lego set with a figure that large as I had not owned the Avenger's Hulk, Goblin King from Teh Hobbit, or Troll from The Lord of the Rings. I think Star Wars fans will be satisified with this Lego adaptation to their brand. This set has been awaited for since 1999. The set is great, with a couple of good features like the gate, but there are two main flaws. First, there is hardly any room to fit the rancor. It really just sits in the middle of the set. Flaw two, it is really twice the price it should be. Thanks for taking your time to read this.